Eassos Recovery is a reliable and intuitive utility that can help you recover lost partitions and lost files with very little effort. The application can recover files and partitions even if they were infected by malware and viruses, deleted by accident or corrupted. The program is incredibly easy to use, as it comes with nicely organized and straightforward functions, plus the built-in wizard takes you through the recovery process step-by-step. 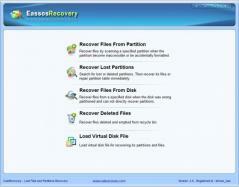 You can set Eassos Recovery to analyze a certain partition and detect the files that can be recovered. You can filter the search to include only specific types of files like documents, photos, videos, music, emails, archives and so on, or have the app look for all of them. A list with the detected files will be displayed when the analysis task is complete and you can select the ones you want to restore. Furthermore, Eassos Recovery can be used to find and fix deleted partitions, as well as recover specific files found on disks that haven’t been partitioned correctly.